This desktop weatherstation is perfect for those who want to know the temperature, rainfall and contrast of indoor and outdoor temperatures. sensor which collects the outside temperature and rainfall data and sends it wirelessly to the indoor display. The rainfall gauge is a very useful feature which is only seen in expensive weatherstations, this product has that and comes with a very reasonable price tag. The external unit has a range of upto 100m allowing placement at a decent location for gauging the weather outside. The rain gauge is easy to mount outside, using the screws included, is self-emptying and has more than 1 years battery life meaning you can set and forget. It comes with a detailed instruction manual of operation. This Wireless weather station has indoor outdoor thermometer and can beat any weather channel on a weather forecast as this is your local weather. This unit does not have barometer or anemometer but comes with a rain gauge. 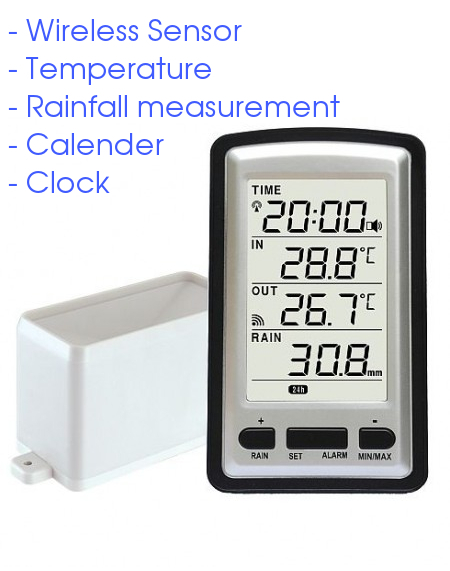 This is a perfect home weather station with a weather clock and wireless thermometer.